NM Jerald Times featured in New York Times article! NM Jerald Times is a chess coach par excellence. Carrying on a venerable tradition left by his friend GM Maurice Ashley, Times is reinvigorating the Mott Hall program. He is the subject of an article in the December 15th New York Times titled, "Chess Offers Young Student Life Lessons at a City School." 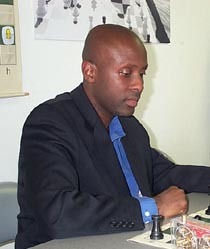 Describing the Harlem native as a man with "a thousand-watt gaze and the skin the color of bitter chocolate," Brent Staples recounts the regiment Times puts his students through and the inherent benefits gained from such an approach. Mott Hall has won six National Championships over the past decade. "Despite poor families and difficult lives, the Dark Knights have repeatedly won championships, beating out students from rich districts where children grow up with every advantage." "About one-fifth of the students who leave this school go on to elite prep schools like Andover, Exeter and Choate. About 50 percent get into competitive public high schools like Stuyvesant, Brooklyn Tech and Bronx Science. These would be staggering numbers in any case, but they are especially impressive given that Mott Hall serves a poor, heavily Dominican district where that kind of academic excellence is rare." It is interesting that during the Wilbert Paige Memorial tournament, some of the Mott Hall students were exposed to some of the strongest Black players in the world. Perhaps Coach Times has designs to bring in some of these talented players to provide the inspiration to improve to higher heights. Staples ends the article with a poignant statement by saying, "What is disheartening is a public education financing mechanism that rewards mediocrity everywhere you look and then forces innovation and excellence to stand on the street, rattling the tin cup." Well said. 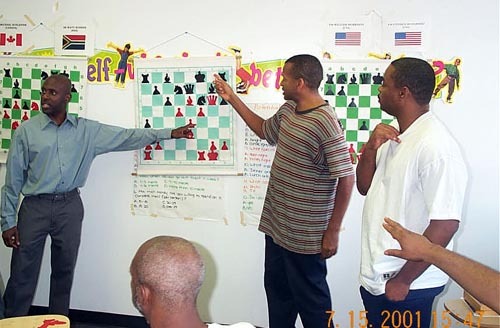 Read "Chess Offers Young Students Life Lessons at City School"
NM Jerald Times (left) analyzes position with FM Stephen Muhammad at the Wilbert Paige Memorial tournament in July 2001. FM William "The Exterminator" Morrison (at right) looks on with the rest of the audience.